DRT harmoncally balanced rotors will help reduce humming noise during braking. Conventional (old school) cross drilled or slotted rotor creates harmonic frequencies (humming noise) during braking. 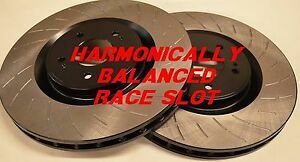 Harmonically balanced cross drilled/sloltted rotors are non directional.